Water quality monitoring is important because so much is at stake. With increasing development around lakes the clear and clean water we enjoy in Maine is at risk of becoming cloudy and murky, deteriorating its aesthetic and environmental value. Losing water quality could also mean losing swimming, boating, and other recreational opportunities. It could also be detrimental to the fish, waterfowl, and other unique Maine wildlife that breathe life into our lakes. In total, declining water quality could represent a loss of the characteristics we treasure in our lakes. 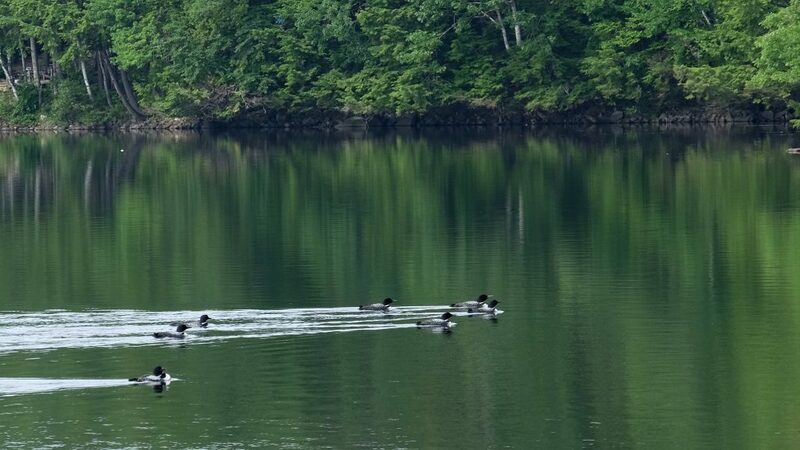 Loons on Flying Pond. Photo courtesy of Karen Kurkjian. How do we measure water quality? Transparency is a measure of the clarity of the water, which is most often influenced by the growth of algae and/or stormwater runoff entering the lake. Secchi depth readings record the level at which a black-and-white disk disappears from sight as it is lowered beneath the surface of the lake (see diagram below). How a Sechhi disk measures transparency, from Maine VLMP, mainevlmp.org. Cold water can hold more dissolved oxygen than warm water and fish and other aquatic species are dependent on certain temperature ranges for their survival. Temperature is measured at 1 meter intervals with an electronic sensor at the deepest point in the lake. Dissolved oxygen values represent the concentration of microscopic air bubbles present in the water, which are necessary for aquatic species to survive. Many factors can influence dissolved oxygen in lakes. These factors include temperature, photosynthesis by algae near the surface, decomposition of organic matter at the bottom of the lake, and seasonal turnover events. Dissolved oxygen is measured at 1 meter intervals simultaneously with temperature on the same electronic sensor. Wind incorporates oxygen near the surface of lakes, but during the summer the temperature difference from the warm surface to cold bottom depths (in stratified lakes) can prevent oxygen from reaching the lake bottom. A loss in oxygen in the lower depths can result in fish kills. Algal blooms can lead to a sharp decline in a lake’s dissolved oxygen levels. Algal growth in lakes is limited by phosphorus, a nutrient that becomes overabundant in lakes most commonly as a result of polluted runoff. 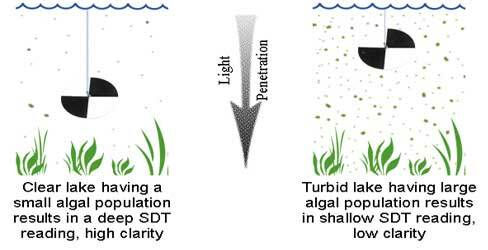 Lakes are monitored numerous ways for potential and present algal blooms, through visual analysis, Secchi readings, and chlorophyll and phosphorous samples. Other measurements that can give us a better sense of a lake’s water quality include: pH, conductivity, alkalinity, color, and sediment samples, which can predict a lake’s likelihood to release phosphorous from the bottom. The land uses and conditions in an entire watershed affect a single lake’s water quality. 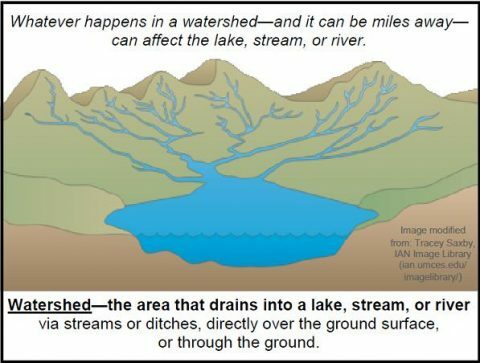 This interconnectedness is especially true in the 30 Mile River Watershed where many of the lakes and ponds are connected by streams. This means that one lake can be easily impacted by poor conditions miles upstream. Acid rain, mercury contamination, invasive species, loss of habitat, and climate change are all threats to our lakes, but polluted runoff is one of the biggest threats. Runoff can cause algal blooms that start a decline in a lake’s water quality. Development in the watershed can increase the amount of phosphorus and sediments washed into lakes and streams through runoff, causing algal blooms and decreased water quality. Examples of development include logging, housing developments, roads, agriculture, and other anthropogenic alterations to the environment. It is important to monitor water quality so that 30MRWA can prioritize efforts to step in and reverse potential downward trends in our lakes. With greater understanding of lake conditions, we can better target and remediate sources of erosion in the watershed. Working alongside all the volunteer lake monitors, through careful sampling and practical improvements, we can ensure our lakes remain as special tomorrow as they are today.